Girlan’s Lagrein is ruby red in color with violet hues. There is a fine and pleasant bouquet with hints of violets. It has a full body and velvety palate. This wine pairs well with grilled and roasted meats, game, and spicy cheeses. 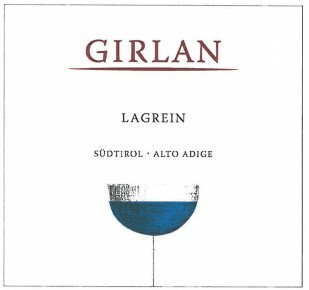 Lagrein is an ancient grape variety that finds its home in the sunny vineyards of Trentino Alto Adige. Its wines are strong and full bodied with plum and wild cherry flavors, and the variety is particularly well known for the deep, dense color it imparts on wines. Lagrein has a characteristically north-Italian fresh, acidic structure and a slightly astringent finish, making it best paired with food. The grape is most probably native to the region, and is thought to take its name from the town of Val Lagarina in Trentino. It has certainly been grown in this area for hundreds of years, and is first mentioned in texts that date back as far as the 16th Century. Other theories give Lagrein a Greek origin, suggesting that it is closely related to wines that were once made around the city of Lagaria in Greece. DNA testing has suggested Teroldego as a possible parent, supporting the theory that the variety is native to Italy’s Alpine northwest. Traditional pergola cultivation (to reduce the risk of excessive sun on the grapes), slowly making its way for the espalier method. Destemming and fermentation with maceration at controlled temperature in steel vats. Subsequent malolactic fermentation. Refinement in oak casks for 8 months.